About Me – Abstract, Pool and Automate IT! Welcome to Abstract, Pool, Automate dot com, a site dedicated to looking at all things related to Software Defined Data Centre and Enterprise Cloud! I’m David Miskell and am employed by Dell EMC Consulting as an Enterprise Architect. I have been working in IT since 2002 and have had roles in Manufacturing, Telco, Legal, Financial Services and Retail prior my recent move to vendor side. I originally wanted to write a blog that focuses on the experiences of someone working for an enterprise customer of Cloud Technology providers and to give an alternative view or narrative to that being pushed by vendors with a product to sell. Everything written prior to July 2016 is fairly agnostic, however having been a customer and now an employee of Dell EMC I will probably start to focus more on the products and solutions we are selling and supporting – mostly because they are really cool and Dell EMC and the Dell Technologies group of companies are the leading player in the Cloud and Data Centre space. That is why I joined them after all! The initial articles are not really technology focused as I wanted to capture the ‘pre work’ that led up to me building a private cloud for a financial services organisation and again subsequently in a large retailer. Its a bit of a diarised retrospective look at how the piece of work evolved over time. I hope others will find it useful as I didn’t anything on my internet travels that really covered these phases. The opinions expressed here are solely my own. You will probably spot that the bias is towards Hybrid Cloud and that is reflective of the organisations I have worked for. However Public Cloud is also very much a focus, as are new application architectures such as Micro Services, Cloud Native Applications and the new platform architectures such as containerization that underpin them. Technology wise I’m very much of the Windows generation and my certifications are based around Microsoft in the form of MCSE’s on Server 2000 and 2003, MCITPs in Server 2008 as both Server and Enterprise Administrator and MCTS’s in Microsoft Virtualisation using Hyper-V.
I’ve been a customer of VMware since ESX 2.5 but have only recently started the certification track and achieved accreditation in the following areas; VMware VCA Data Centre Virtualisation, Cloud and Workspace Mobility. I have the VCP Data Centre Virtualisation certification on vSphere 5 & 6 too. The Private Cloud Strategy and resulting VMware vCloud Suite & NSX project I led for Skipton Building Society won the Customer award for Best Hybrid Cloud Project at VMworld Europe 2015. I have also been awarded the vExpert 2016 and 2017 status for support of the VMware community in the past. 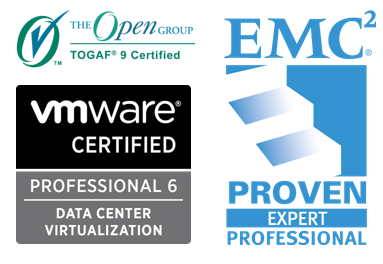 I am also TOGAF 9.1 certified and hold the EMC Certified Cloud Architect and ITaaS expert accreditations as well as some other odds and ends I have accumulated across the years such as CCA Xenapp 5, ITIL Foundation, Comptia Network+. I’m married, have two children and live in Lancashire in the United Kingdom.